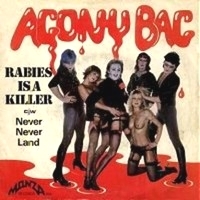 The British band Agony Bag was founded in 1976 by saxophonist Clive Jones and drummer Clive 'Bok' Box who also been part of Black Widow. With Agony Bag they wanted to push the limits and added costumes and make-up to get a more theatrical stage show. After completing the line-up - Clive Jones took over the lead vocals - they started playing clubs in Leicester area. They caught the interest of Mark Pollard who became their manager. He added two dancers and polished their show a bit. They played some shows in Germany and even recorded this single in Germany in 1979. In 1980 the single was released by Monza Records and the band play some more live shows. Later that year Clive Jones left the band and that was the end of Agony Bag. With thundering riffs starts Rabies Is A Killer and for awhile they stay to the riff and the repetitive title line. Unusual is the saxophone in their sound. In the middle of the song the refrain is sung in German! Musically the song seems to be inspired by The Rocky Horror Picture Show... Its more the atmosphere of the song while the vocals are punk-influenced. Very unique and fun to listen. Agony Bag had their own unique sound, but perhaps the timing wasn't right.... A pity that this was their only release!